Giving up a government job to keep alive the textile heritage of Himachal, is at the very least surprising, especially in a country driven by a craze for government jobs. However, Om Prakash Malhotra believes in following his heart. Driven by his passion, he quit his government job in 1998 to carry forward the family legacy of handloom work, that was being taken care of by his mother and wife. The one-time small-scale family business of handloom work gradually assumed new dimensions. Malhotra now has a composite unit called Krishna Wool running under one roof in Mandi town, manufacturing yarns, shawls, stoles, tweed prepared from natural fibres such as Pashmina wool, Angora wool, Yak wool, silk Pashmina wool and Marino wool. The designs on the shawls and mufflers are inspired by Kullu and Kinnauri motifs. Having worked in handlooms and handicrafts for the past 18 years, he has trained nearly 600 people in the field so far. He goes the extra mile, not charging at all for the training and even providing the necessary raw material. Today his family not only earns a good income, but is happy and content that they are providing livelihood to over 150 people, most of them women. “My father and mother were into small-scale spinning and weaving which I had also been closely associated with from a tender age. I had also helped them in hand spinning with a spindle that was the only means in those days. They never forced me to continue with it, and instead educated me and encouraged me to pursue a government job,” he said. After completing Automobile Engineering from Government Polytechnic College, Ambala, in 1975 at the age of 23, Om Prakash Malhotra joined as Junior Engineer in BSNL and later worked with Public Works Department and Irrigation and Public Health department in Mandi district. His entire family is dedicated to the promotion of the textile industry and it includes generation next. One of his daughters after completing a Textile Engineering course is assisting him in his family business, while the other is an Assistant Professor in Textile Engineering at Jawaharlal Nehru Government Engineering College Sundernagar, Mandi. His contribution has been acknowledged as he was conferred with Shilp Guru Award-2012, bestowed on him by then-President Pranab Mukherjee in 2015. He was among eight craftsmen who have conferred the award that year. 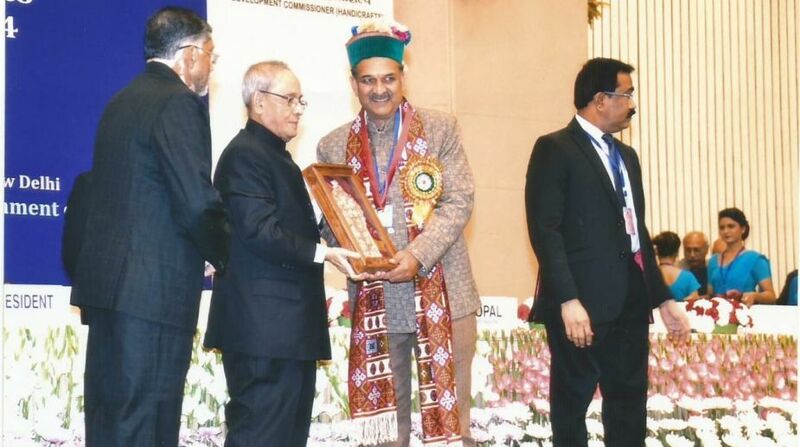 The Himachal government in recognition of his work awarded him first prize in 2006 for excellence in handloom and handicraft. His daughter Anshul Malhotra has also earned recognition for her contribution. After making her presence felt at the international competition in Delhi, she was invited to China to represent India for the first innovation and entrepreneurship international competition. Anshul has also won the ‘Kala Mani’ award at the Suraj Kund international craft Mela for her outstanding craftsmanship for her shawl design in 2015. “Our traditional handlooms and handicrafts are battling modernity and are being pushed to die a slow death. There is a dire need to preserve and revive it,” he lamented. 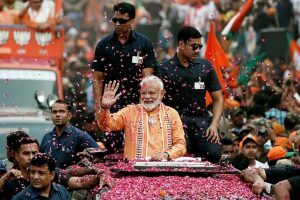 This can be achieved by promoting it along with tourism industry and also through the Ministry of Skill Development and Entrepreneurship, he suggested, adding that these are suitable means to give a boost to handlooms and handicrafts.